Nokia is betting its future on Microsoft’s mobile OS, and on Wednesday introduced its first Windows Phone 7 device, the Lumia 800. If the Lumia 800 looks familiar, that’s because it’s similar to the Nokia N9, which runs OS (MeeGo) soon to be ditched. 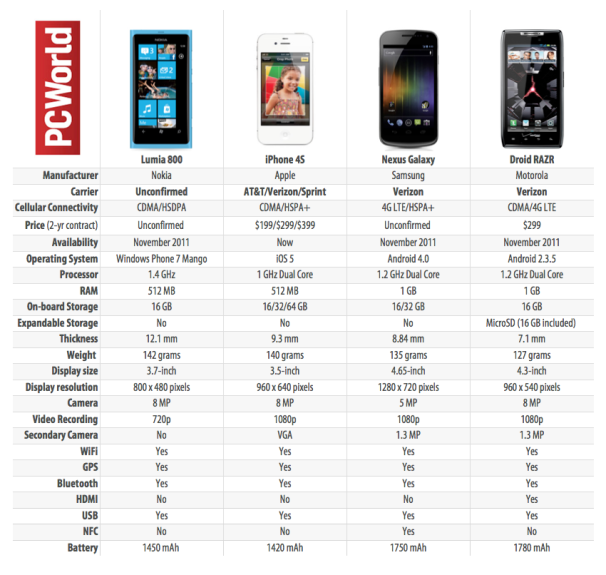 The Lumia 800 brings a few improvements over its relegated sibling, including a faster processor, but compared to the big boys, the iPhone 4S and the latest Android Galaxy Nexus and Droid RAZR, Nokia’s flagship is still falling behind. The Lumia 800 has a smaller curved 3.7-inch screen than the N9, which had a 3.9-inch display -- a change needed to accommodate the three hardware buttons Windows Phone 7 OS requires under the display. Lumia’s display is slightly larger than the 3.5-inch screen on the iPhone 4S, but significantly smaller than the huge 4.65-inch display on the Galaxy Nexus. Nokia’s phone also has the lowest display pixel density at 800 by 480 pixels, a far cry from the Nexus Galaxy’s resolution of 1280 by 720 pixels, or the Retina display on the iPhone 4S, which has the highest pixel density in the comparison. Nokia can’t brag about how slim the Lumia 800 is. At 12.1 mm, it’s the thickest phone in the line-up. It’s also the heaviest, at 142 grams, a hair more than the iPhone 4S and the Nexus Galaxy. On the inside, the Nokia Lumia does not feature a dual-core processor: it has a 1.4GHz single-core processor with 512MB of RAM. In comparison, the iPhone 4S runs on a 1GHz dual-core chip with 512MB of RAM and at the top of the line there’s the Galaxy Nexus with a 1.2GHz dual-core chip and 1GB of RAM. The Lumia 800 is a mixed bag in the camera department. It has an 8-megapixel camera with Carl Zeiss lens on the back, like the iPhone 4S, but unlike Apple’s phone, it doesn’t record 1080p HD video, only 720p. Even Galaxy Nexus’ 5-megapixel-camera records 1080p video. Surprisingly, the Lumia 800 doesn’t feature a front-facing camera for video calls, which makes it the only phone in the comparison without one. Overall, Nokia’s Lumia 800 could be an interesting proposal for those who want a smartphone that’s not an iPhone or Android, with solid guts and shiny looks. But when compared to its competitors, the Lumia 800 does not have anything extraordinary to offer: it’s not the thinnest or fastest of phone, nor has it the best camera or extra features (no expandable storage, no secondary camera, no HDMI, no NFC). Nokia didn’t say which US carriers would sell the Lumia 800. The phone becomes available in November for around $584 unlocked.